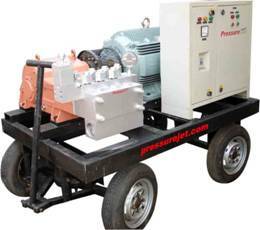 PressureJet Systems Pvt. Ltd manufactures High Pressure waterblasting pump. PressureJet Systems Pvt. Ltd offers high pressure, reciprocating triplex plunger pumps, etc. This High Pressure Waterblasting Pump is commonly known as water jetting. It offers a widespread abrasive water discharge operation and is very successful because of its powerful blasting effect. In most cases, because of its efficiency, waterblasting will require only one operator for a given application.